So I've decided that I'm going to try to learn French. This is not an easy feat for me, as foreign languages are, well, foreign to me. I've purchased several books, including Living Language: French Complete Course (this came with a CD that I downloaded onto my iPod) and the LaRousse French/English Dictionary. I'm hoping these will get me off to a solid start in hopes of taking a couple of classes at the French Institute (I'm really excited about the French cinema course). 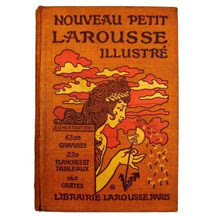 There's one book I've been wanting, but can't bring myself to buy, Nouveau Petit LaRousse Illustré. We'll see how it goes.